Mr. Muhammad Shabir is a graduate in Quantity Surveying (UK) and also has a TEC Diploma in Building Studies (UK). He has over 20 years experience in estimation, tendering, contract documents and appraisal, contract administration and management, cash flow forecasts, financial feasibility studies, “Cost-in-Use” studies, valuations and escalations etc. 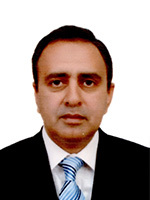 He has worked for Quantity Surveying Consultancy firm and Contractor in UK and joined National Logistic Cell as a chief Quantity Surveyor after returning to Pakistan. He has also worked with National Highway Authority as a Quantity Surveying and Estimation Specialist, during his stay in NHA he prepared Composite Schedule of Rates.